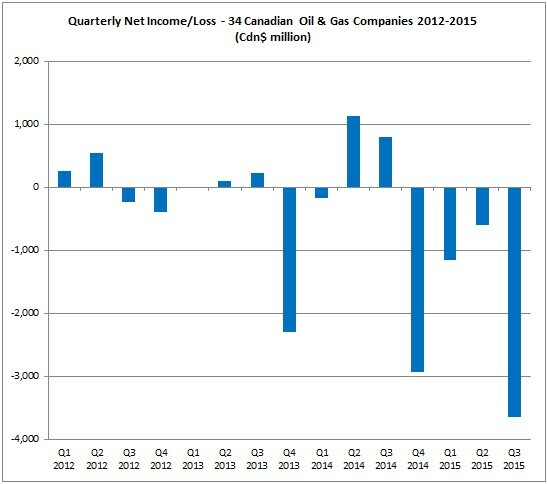 Canadian oil and gas companies have recorded major losses as a group for the 3 month period ending September 30, 2015, according to new analysis of quarterly data by CanOils. Low commodity prices have continued to have a huge impact on income statements for oil and gas companies since the end of 2014, with margins being squeezed and huge impairments being recorded across the board. This analysis from CanOils shows that Canadian companies are feeling the same effects as their counterparts across the border in the U.S., whose earnings were analysed using Evaluate Energy data recently. 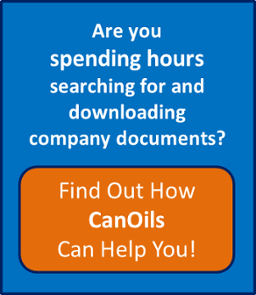 In this report, CanOils has used Q3 2015 data from the income statements of 34 TSX and TSX-V companies (“the group”) that produce mainly in Canada and have production between 5,000 boe/d and 200,000 boe/d. The full list of companies is available here. In total, these companies produced 1.29 million boe/d in Q3 2015. The losses for these companies were far greater this quarter compared to previous periods. In Q2 2015, the group made a combined net loss of Cdn$596.5 million but, three months on, this had slumped to a staggering Cdn$3.64 billion loss. Source: CanOils, see note 1. Sign up to the CanOils & Evaluate Energy Mailing List here and be informed as soon as new analysis reports like this are available. 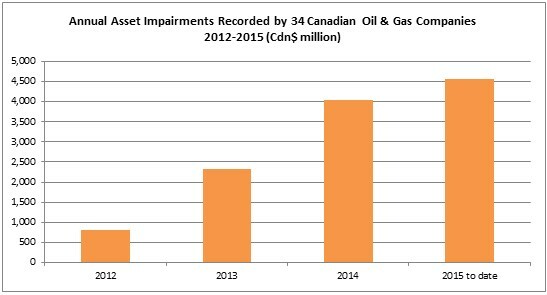 The big reason for the steep drops in Q4 2013, Q4 2014 and Q3 2015 is that this is when the companies recorded impairments – Canadian-listed companies are required by IFRS to assess their assets for impairments either once per year at year-end or following the discovery of an indicator of impairment. Only a handful of the group of companies recorded any impairment outside of these three quarters. So far in 2015, impairments for the group have hit Cdn$4.57 billion, which is a higher total than in any of the last four years. 2015’s total represents a 14% increase over 2014’s annual total of Cdn$4.03 billion (which was also likely caused by the collapse in global commodity prices) and almost double the 2013 total of Cdn$2.32 billion. 23 companies out of the 34 companies have recorded impairments in 2015, compared with only 18 in 2014. Source: CanOils, see note 2. Sign up to the CanOils & Evaluate Energy Mailing List here and be informed as soon as new analysis reports like this are available. 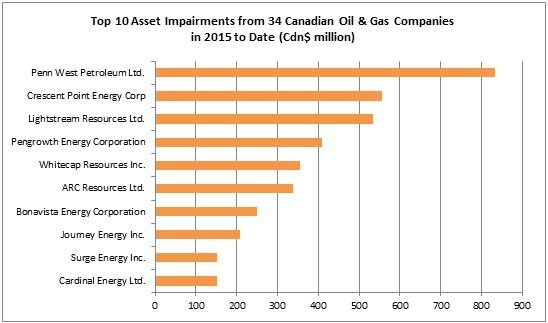 On an individual company basis, the biggest asset impairments of 2015 to date have been recorded by Penn West Petroleum Ltd. (TSX:PWT), with a total of Cdn$834 million. Penn West’s impairments relate to its properties that are being sold in the Weyburn area of southeast Saskatchewan and the Mitsue area of central Alberta as well as certain non-core properties in the Fort St. John area of northeastern British Columbia and in the Swan Hills and Wainwright areas of Alberta. All data in this report was created using the CanOils database, which holds over 10 years of oil and gas financial and operating data for TSX and TSX-V listed companies. 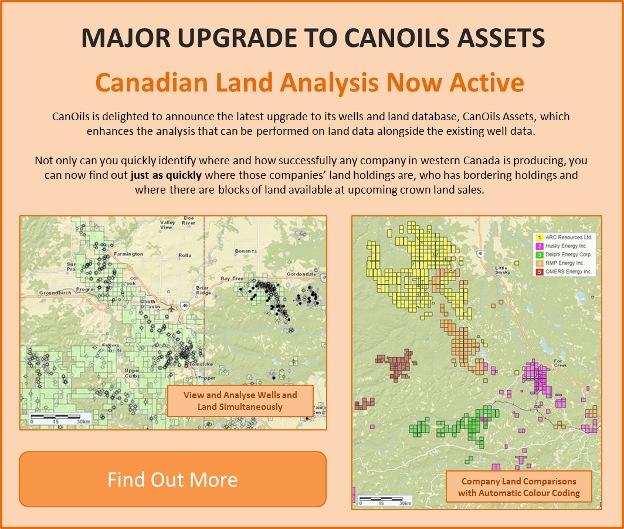 CanOils also now has a comprehensive wells and land database covering all of Western Canada, CanOils Assets, which has just gone through a major upgrade process, find out more here. 1) Net income/Loss here refers to post-tax net earnings on the 34 companies’ income statements; the figures have not been adjusted for non-recurring items such as impairments, gains or losses on asset sales or unrealised gains or losses on hedging contracts. 3) Pengrowth also recorded a goodwill impairment of Cdn$73 million in Q3 2015, which is not included in the Cdn$409 million total mentioned here. 4) The 34 companies were chosen as they had all reported preliminary results by the morning of November 12, 2015 (UK time) and were all domestic, non-oilsands Canadian producers with production between 5,000 boe/d and 200,000 boe/d. The full list is available here.